This past weekend I bailed on riding the Orange County 300k because I was still sick from last week. Riding 210 miles on Wednesday while sick definitely did not help me get better (a post about that ride coming soon!). So I flaked and instead hung out hard. Fifty-five chill miles Saturday with a posse riding some of my favorite climbs near the Rose Bowl. Then dinner at one of my favorite spots in the LA area, Happy Family. It’s all vegan, which is good. It’s an all-you-can-eat menu where each dish is made to order and that’s great. AND it’s some of the best Chinese food I’ve had in California, which is unbelievable. Win-win-win. 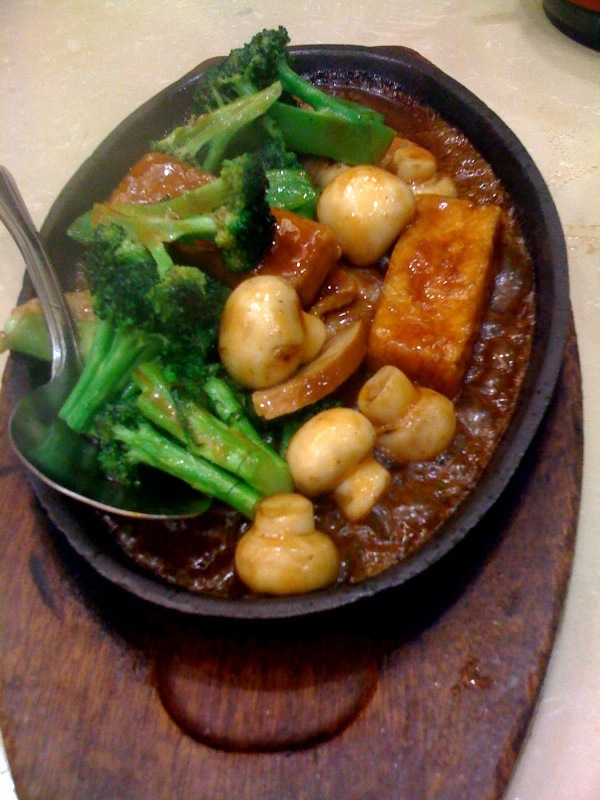 Sizzling Plate. Look at those bubbles in the sauce! Sunday some friends had a vegan brunch unrelated to the sporting event, but I ate cinnamon rolls as if it was a sporting event of its own. Then we rode around the neighborhood and visited friends who have recently moved here. East Hollywood represent! Lastly I’d like to share what I’ve been listening to over and over. Enjoy.